ABOUT US | RENTAL PROCEDURES & DIRECTIONS | Hit and Run Productions, Inc.
Hit and Run Productions, Inc. is a New York City based film production and rental company that has been operating since 1990. The company was founded by New York University graduate and independent filmmaker Ari Taub. Our goal is to provide professional equipment to other contemporary filmmakers at reasonable rates. All the staff at Hit and Run are themselves filmmakers, so they fully understand the production needs of each customer. Hit and Run has an extensive equipment list, which includes everything from Arriflex film camera packages to Fostex sound recording equipment. Hit & Run also has an extensive wardrobe and props department that includes includes police and military uniforms, theatrical handguns, and rifles. Hit & Run can also provide any production unit with a professional crew based in New York City. Hit and Run can also deliver the equipment to your door step for very affordable rates. Reserve your equipment in advance of the rental day. All equipment has been checked by our staff before leaving our premises, however, you are invited to inspect the equipment before taking it. Any rental returned after 2pm on the return date will be charged a rental fee for that day. Insurance is required on all rentals. Credit card deposits may be used in lieu of insurance for deposit. The cost of damaged equipment will always be paid by leasee. Lost or stolen equipment stays on rental until paid for or replaced. Minimum order $100 on all rentals. Email us with a list of items you want, or telephone one of our representatives at (718) 809-9057 to reserve equipment. Our hours of operation are Monday-Friday 9am-6pm. Saturday and Sunday pickups and returns can be arranged for an additional charge. Take the outer roadway of the Williamsburg Bridge to Brooklyn. Get off at the 2nd exit (Local Streets exit). Take your first left onto Havemeyer Street. Turn left at Metropolitan Ave, and take a right onto Roebling Street. Drive 3 blocks. 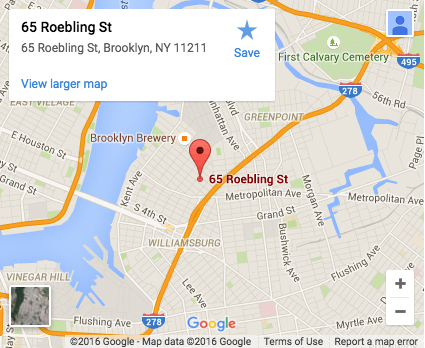 Hit and Run Productions is located at 65 Roebling Street, on your right between North 7th and North 8th Street. Ring Buzzer #202. Take the L train toward Brooklyn. Get off at the Bedford Ave. stop, the first stop in Brooklyn. Exit the station at the front of the train, and take the left exit (Driggs Ave). Walk straight out of the station one block along North 7th Street to Roebling. Cross Roebling and take a left. 65 Roebling is on your right. Buzzer #202.